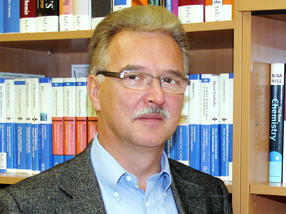 Thomas Heinze, born in 1958, studied chemistry at FSU Jena. After receiving his doctorate there in 1989 and subsequent postdoc work at KU Leuven (Belgium), he completed his habilitation in 1997. In 2001, he accepted a professorship in Macromolecular Chemistry at the University of Wuppertal (Germany). He has held a professorship in Organic Chemistry at FSU Jena since 2002, where he is also the Director of its Center of Excellence for Polysaccharide Research Jena-Rudolstadt. From 2010–2014 he was appointed as Finland Distinguished Professor (FiDiPro) at Åbo Akademi, Department of Chemical Engineering, Fibre and Cellulose Technology, Turku, Finland and in 2017, he was active as Visiting Professor at University of Natural Resources and Life Sciences, Vienna, Austria. Thomas Heinze is active as Program Chair of the “Cellulose and Cellulose Derivatives” section of ZELLCHEMING (The Pulp and Paper Chemists and Engineers Association in Germany). He acts as Vice Chair of the steering committee of the “Research Centre for Medical Technology and Biotechnology GmbH”, Bad Langensalza, Germany, as Curator and Scientific Advisor of the Thuringian Institute of Textile and Plastics Research, Rudolstadt, Germany. He published 470 scientific papers, hold more than 32 patents, and is author of 3 books, such as the just recently published book “Cellulose derivatives: Synthesis, structure, and properties” (1st ed. 2018, Springer). He acts as scientific consultant for different international companies. Since 2003, he supervised 51 BSc, MSc and Diploma thesis and 31 PhD thesis. For his scientific activity he was awarded with numerous awards including the Anselme Payen Award of the American Chemical Society (2010), the Dr. Edmund-Thiele-Denkmünze, Zellcheming Association (2012), and he won the Thuringian Research Award (Ultrasensitive immuno-assays for emergency medicine based on nanostructured polymer membranes) in 2014. His research focuses on the development of polysaccharide materials in the macro- and nano-scale for applications in biology, medicine and technology. Modern organic chemistry is used to get novel polysaccharide products under heterogeneous and homogeneous reaction conations applying unconventional methods. Moreover, detailed structure characterization applying 1D and 2D NMR spectroscopy and further advanced analytic tools are established in the field of polysaccharides and their derivatives. Polysaccharides are not only the most important source of renewable feedstock but also biopolymers with amazing structures to design advanced materials in the frame of the sustainable chemistry.